Stunning custom built home on 171 feet water of frontage and 2 acres in popular Hidden Lake neighborhood. 2 story entry, beautiful Brazilian cherry flooring most of main level . Panoramic views ,from most windows. Formal living room & dining. Lakeside office/library w/built in book shelves.Butlers pantry /bar leads to gourmet kitchen w/ custom cherry cabinets, Wolf gas range, stainless sub zero refrigerator, granite counters, breakfast bar. Glass door out to deck and private back yard. 9 ft ceilings on most of main level. 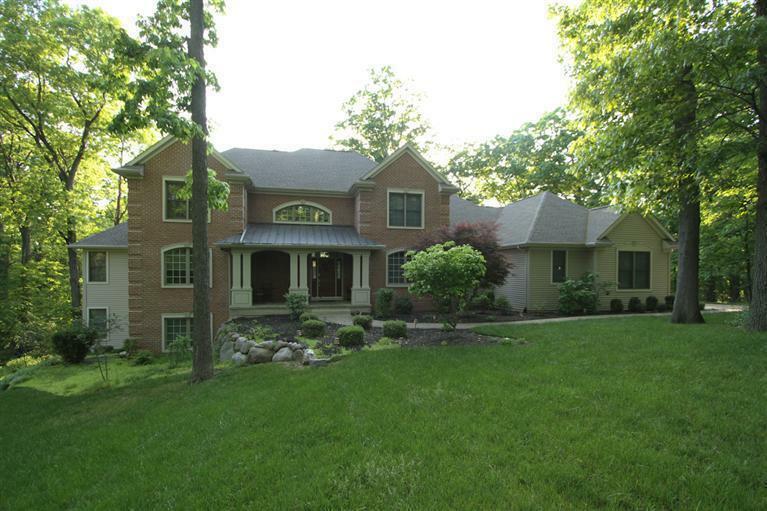 Family room has 12 ft ceilings wall of windows over looking the lake & stone hearth fireplace. Main floor laundry & mud room. Master suite is enormous! Luxury bath w/heated flooring & towel rack, jet tub & walk in shower Curved stair way to upper level w/3 large bedroomsone with private bathroom the other Jack and Jill.Laundry chute. Lower level walk out with one bedroom play room or 2nd office. Work out room, full bath and great entertaining area with 2nd fireplace.All baths have granite and laundry room. Home is beautifully decorated and ready to move into.